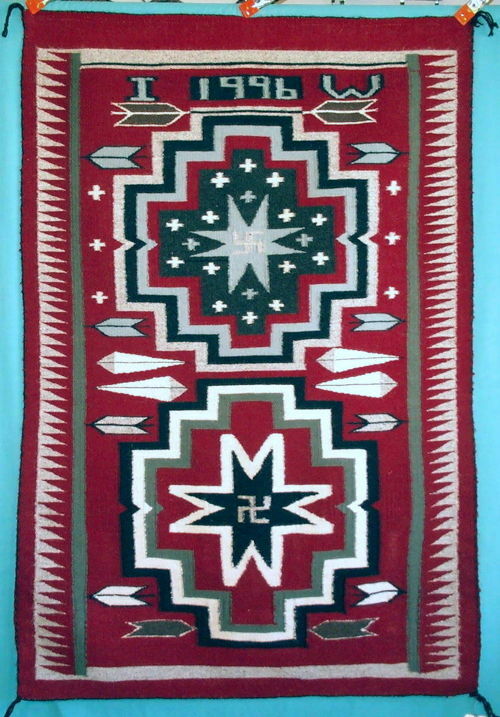 128K This Teec Nos Pos style rug is 41" x 51" . It displays the company's short name: "INDIAN WEAVING". It was an exercise in bilateral symmetry using a modified Teec Nos Pos field design with a wide complicated border balanced around the entire rug. 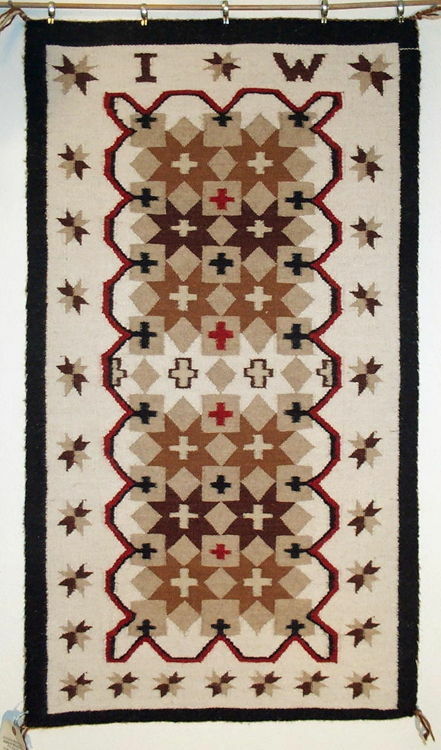 The field design is similar to one shown in The Rugs of Teec Nos Pos - Jewels of the Navajo Loom by Ruth Belikove, page 18. The Teec border is similar to the one shown on p. 19 of the same book. The denim indigo-blue field yarn came from Wild West Weaver in Connecticut. I spent five months weaving this piece for display at my show booths. It was the first weaving in which I made extensive use of weft-interlock joints. Both weft-interlock and stack joints have been used where appropriate. 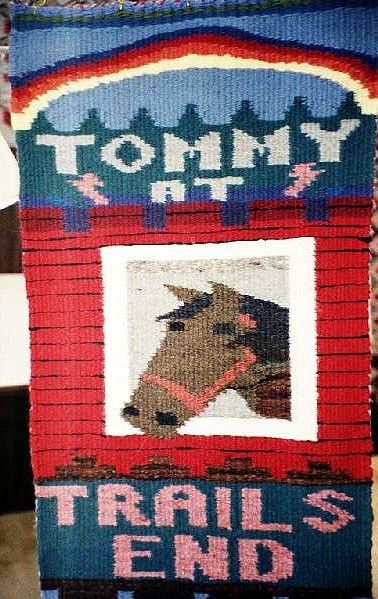 106K This 15" x 39" pictorial displays my childhood horsefarm "Trails End" along with my first pony, a Shetland named Tommy. It was woven for my parents as a Christmas gift. It was a lot of fun to weave. 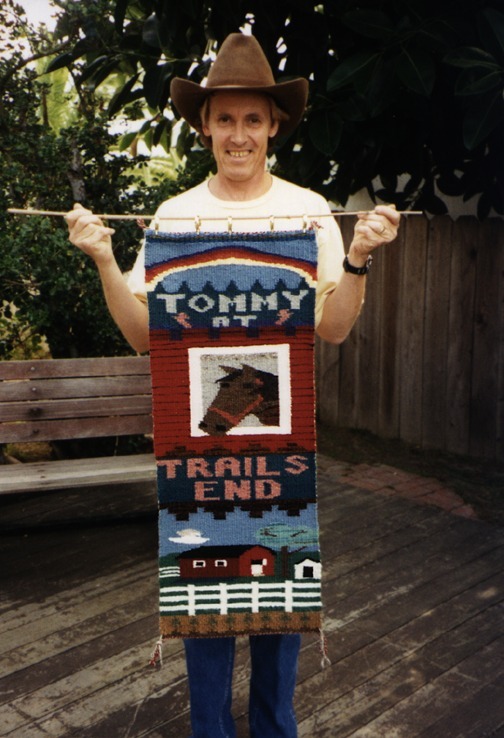 This was my monumental weaving project from Jan. 1997 - March 17, 1998, taking 15 months to weave (part-time) this detailed 45" x 9' runner. The birth on March 17 was beautiful and it lays perfectly flat and is perfectly rectangular with straight edges. It is my third Navajo-loomed tapestry. This weaving has a Hereford cow, a Palomino horse, a goat, a black-faced sheep, two chickens and assorted other pictorial elements scattered throughout. It also has both the Big Dipper and Little Dipper woven into it in white and light blue stars, in proper heavenly orientation to each other. These stars are embedded in the field in the upper third of the weaving. More surprises await if you can get close to it. 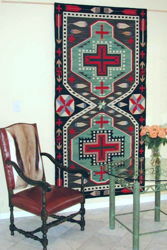 58K This 20" x 40" tapestry was woven in the tradition of the traditional double saddle blanket with pictorial elements. In this regard, it has affinity with the Navajo Sunday or Parade Saddle blankets. 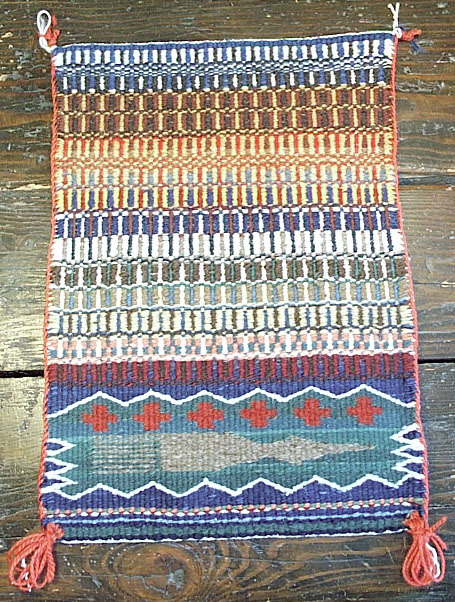 The reciprocating "running dog" double border surrounding the bottom half was chosen to add life or motion to the weaving's visual impact. It presented a technical challenge. Motion is reinforced by the smoke coming out of the hogan's chimney, blowing across the weaving and on out of the geometricized "running dog" border of the top half. The clouds abutting the buttes merge into the top row of white crosses. The repeating pink stepped buttes (for the Escalante Staircase's Vermilion Cliffs of southern Utah) reflect the affinity of many Navajo designs to graphic representations of the Colorado Plateau landscape. These stepped buttes are reflected in the row of red crosses above them. From bottom to top, this textile opens up as the border vanishes, allowing the landscape to permeate and dominate the entire upper space, hinting at the expansiveness of Indian Country and the four-Corners. My Seventh weaving was a commissioned piece for a designer who wanted a specific idea materialized into a Navajo-loomed rug suitable to be folded in half and sewn into a purse. It all worked out great and was a creative project. I was elated to see such a simple design manifest so artfully. 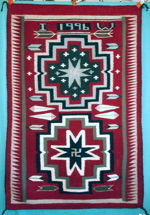 My rug taught me about the value of simplicity and repetition, important aspects of Navajo tribal design. The yarns are all Brown Sheep Co. single ply Navajo wool yarns blended with 15% mohair (Worsted wt.). 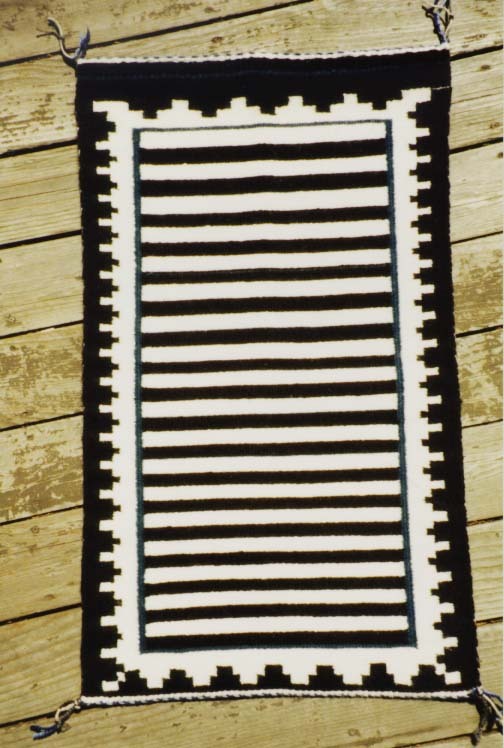 My client wanted a Hopi Koshare ("clown") Navajo-loomed rug, so we designed simple black and white stripes with a complementary border. Up close, you will see the occasional "indigo" blue stripes with which I outlined several of the black stripes -- makes things more interesting and cultural in a subtle way. I varied the border designs' mesa proportions: the sides are identical but each end is different: 3 variations on the traditional stepped mesa border. The "rug" is 22" x 38". 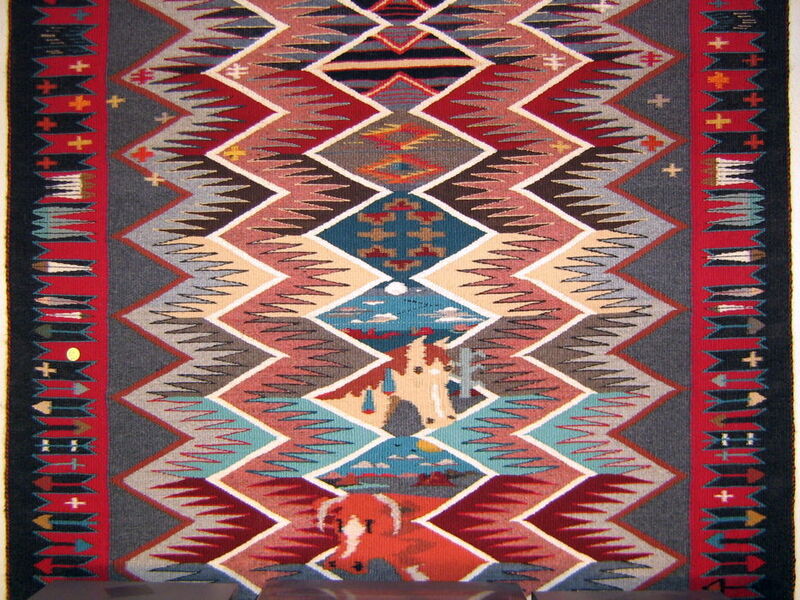 A large durable floor Navajo-loomed rug was my basic concept for this weaving. I chose thick yarns and a loose warping as an experiment to see how fast I could weave a large rug -- part time. The wool yarn used is the rug yarn sold by Weaving Southwest, a New Zealand wool. I used a triple selvage (each of the 3 2-ply cords is a different color) on this weaving and barber pole end cords (i.e., 2 2-ply end cords each of a different color). 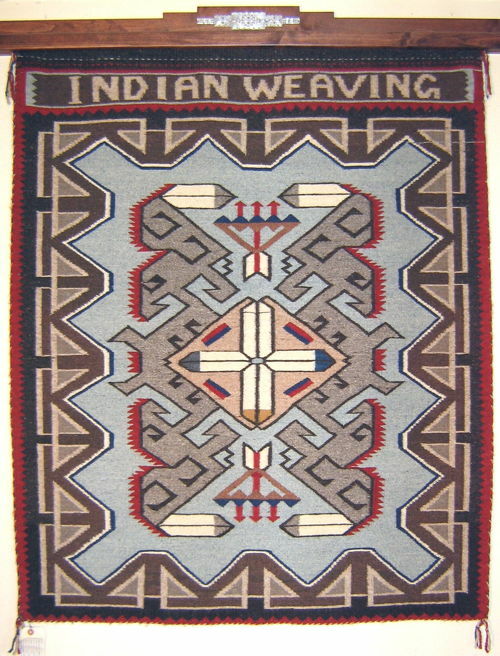 My warp is a 3-ply wool for durability, a characteristic of other large Navajo rugs being woven by the Navajos today. The large green medallions are variations on the 8'x8' Germantown weaving shown on the cover of the recently published show catalog by the Southwest Museum, Los Angeles. I doubled the medallion and reduced it in size. Then I used that Germantown's checkerboard meandering border for my rug too. 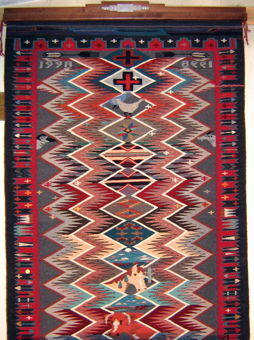 The colors are sort of Germantown colors, not traditional Navajo rug colors. 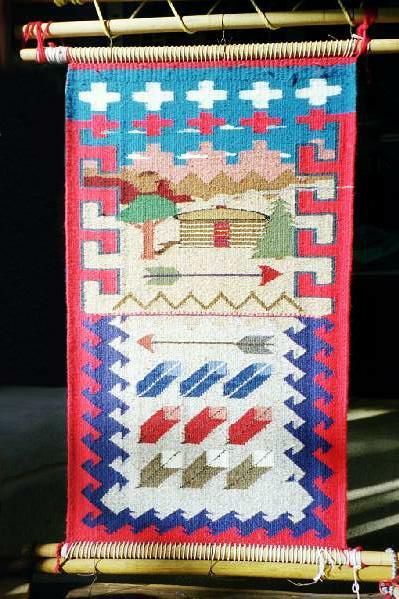 I wove in many Navajo pictorial elements, including my own creation of the arrow shafts at each end with weaving combs on them with thumbs included. The large Saltillo Vallero stars at the center sides are taken from many of the Vallero Saltillos which have been published. Some of these true Saltillos also place the large 8-pointed stars in this position. Overall the colors come off a little Mexican or Saltillo I think, or Germantown. I sold this piece to a local collector. It's my take on a durable and decorative Navajo-loomed wall piece or floor rug that took only 5 months to weave. It is 44" x 97". 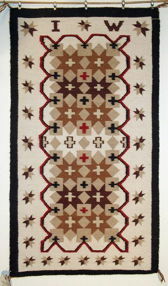 Two Grey Hills Navajo rugs are characterized by natural colored yarns, bilateral symmetry and a black outer border, in a nutshell. For my effort in this design tradition, I asked a Churro sheep rancher in Ridgecrest CA to hand spin a natural white Churro yarn carded with up to 30% white natural mohair (Angora goat). She also provided the handspun natural black Churro yarns and the dyed yellow Churro yarns which are used in the center crosses. The 2 darker browns were obtained from a supplier of Two Grey Hills Navajo yarns. The camel-color yarn in the field was obtained from a Tucson yarn vendor. The red is a "Trading Post" yarn from Weaving Southwest. My design concept was for a sparkly, finely-woven, beautiful rug. What better way to achieve the sparkle than to fill the rug's border and field with Vallero stars (3 sizes of stars woven in the borders)? Due to disparate yarn densities, some of the finest yarns packed to 70 wefts/inch while the handspun white packed to around 20-24 wefts/inch. This disparity required a lot of filling in to balance the different weight yarns. This rug is so finely woven that it took 6 months to weave it. It has triple selvage cords in beige and 2 browns for complete edge protection. This one will age nicely. I added my "I" and "W" signature for Indian Weaving or Indiana Watson in the top border along with a Weaver's Pathway (Spirit Line) exiting at the top right. A loopy red and black border surrounds the field stars. The size is 24" x44". Navajo twill weaving on a Navajo loom is a technique borrowed from the Pueblo weavers: the Hopi, the Zuni, and yesterdayís and todayís many Pueblo Indians who are now established in New Mexico. Twill woven textiles have been used ethnologically as clothing and blankets from the earliest weaving days by non-Navajo Native Americans like the Ancient Puebloans. The Navajosí skill in the technique was highly developed by the 1700s. I chose to learn the twill weaving techniques because I wanted to know how to restore them. My Navajo friend and weaving teacher Roy Kady of Teec Nos Pos taught me how to set up the twill loom at his sheep camp in the Carrizo Mountains south of Teec Nos Pos, Arizona in September, 2000. From there, I proceeded to weave on my own the diamond twill sampler shown here, size ~14" x 20". Weaving is part time for me so this one was on the loom for 18 months, completed March, 2002. The Native American loom which is organized for weaving twills is about 4 times more complicated than the loom setup for regular or tapestry weave (simple back and forth weaving). My twill loom was prepared so I could weave any of the twill patterns on it (at least 6 different patterns depending on how you count them). Each pattern, whether diamond, box, regular, diagonal left or right, etc., requires a different set of the 4 loom heddles used in different sequences. Roy told me to warp my loom "Hopi-style". What he meant by this is that the figure 8 warping of the Navajo loom does not apply here. I simply had to loop my warp string over the 2 end bars instead of making the figure 8 between them. This sounds simpler but itís more complicated for 2 reasons: the warping for twill is always tighter than tapestry warping; and the looped warps can easily get confused while warping. By this I mean a warp loop can creep over its neighbor and destroy the proper sequence of warp loops when adding the end cords. Great care must be exercised not only during warping the Hopi loom and adding the end cords, but then again when adding the 3 heddles besides the shed rod. At least an extra day is set aside to warp Hopi when compared with Navajo due to the time needed to add the heddles. In fact, with Hopi warping, no shed rod as such exists as all 4 heddles are added after the warping, unlike Navajo looming where the shed rod (essentially heddle #1 on the Hopi loom) must be inserted during the warping procedure to maintain the warpís figure 8 integrity. My twill is presented here upside down from how it was on my loom. The weaving comb at the bottom I wove last (at the top), covering the top ~6" of the weaving. We show it this way because itís was slightly wider at the top as it came off the loom. The weaving looks better shown with the wider section at the bottom. The weaving comb section with the white border is woven in tapestry technique instead of diamond twill. Since the loom is warped so tightly, I floated my tapestry woven wefts over at least 2 warps at a time otherwise it would have been too tightly woven. I retained the 2 Hopi heddles which catch opposing warp sets so I could complete my pictorial twill sampler using this modified tapestry technique. The selvage is composed of 3 x 2-ply orange colored cords. 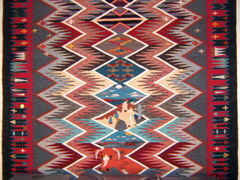 Often the best Navajo and many Hopi/Pueblo weavings (the oldest diagonal twill saddle blankets, Germantown blankets, Classic period serapes, Chiefs blankets, twill mantas, etc.) were woven with 3 selvage cords. Three cords provide 100% protection of the sidesí weft loops, unlike the commoner 2 selvage cords. The very best quality weavings also have 3 end cords, unlike the common 2. Here again, the 3 end cords totally protect the warp loops from damage. Three end cords are more rare than 3 selvage cords, in my experience in dealing with very old Navajo and Puebloan weavings. I have owned 2 Navajo, diagonal-twill woven, early, patterned saddle blankets which had both 3 selvage cords and 3 end cords. Such an expert Navajo weaver is thinking extra long life and durability when they take the care and time required to create triple-corded perimeters on their textile! 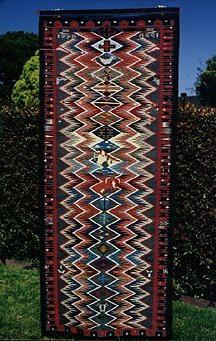 The tassels at the bottom are put in exactly as the Navajos did on their best saddle blankets, and later on the better early Transitional blankets, to further protect the corner from damage. The tassels here are simply composed of the 3 leftover lengths of the selvage cords which are then woven and looped back and forth into their respective corner areas. Sometimes the Navajo weavers used some additional, different colored, 2-ply cords to add such hefty corner tassels to both saddle blankets and the Transitional blankets. About 1/3 of the way through weaving this sampler, I learned to dye with indigo. I wove many different shades and yarns of my own indigo-dyed blue and green yarns into it because the colors are so beautiful. I wanted to see how the different shades would look, once woven. The greens are originally yellow yarns which were dyed with indigo. The brown weaving comb is natural color, hand spun Churro yarn obtained from a sheep rancher in California, as is the white used throughout which is a carded, hand spun, glossy 30% mohair Angora goat / 70% Churro sheep yarn. All of the pink and red yarns in the bottom third of the twill as shown are cochineal-dyed. Note the different aspect of the weavingís appearance from each side, both of which are shown since they look different from each other. Any twill is going to have more wool per unit area than any tapestry woven textile which uses a similar weight yarn. 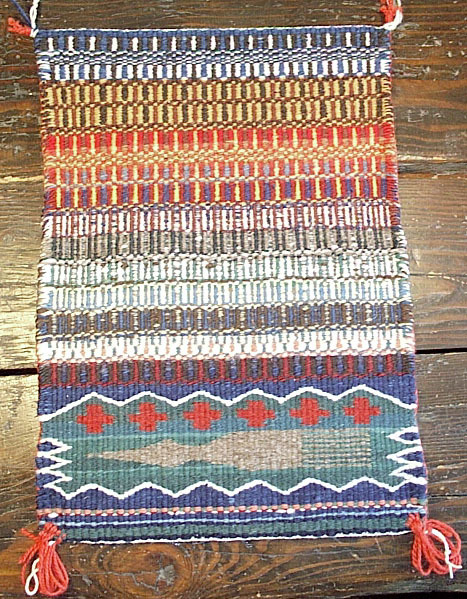 Since the twills are therefore thicker, the Navajo-woven ones are often these days used for saddle blankets and serve well as rugs too. Weaving a diagonal twill, patterned saddle blanket would be a fun next learning experience but Iím happy enough with having finally gotten this one done! 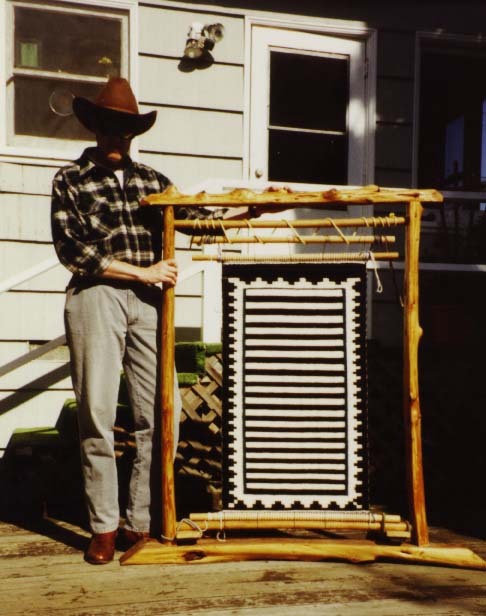 The First Phase blanket is shown partially woven on the loom at the Jackson's home in March, 2003, with the long lazy lines evident. (Click image to see larger version.) 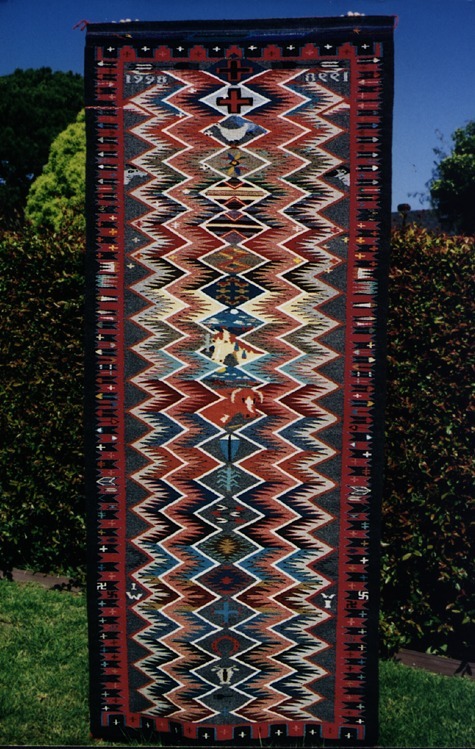 The company commissioned the weaving of a replica of the First Phase Chiefs Blanket in the William Randolph Hearst Collection as described by Nancy J. Blomberg in Navajo Textiles: The William Randolph Hearst Collection (shown). The weavers were Susie and Albert Jackson, Navajo weavers living near Cove, AZ. Susie belongs to the accomplished Joe family of Navajo weavers, many of whom are published in Marian Rodee’s book Weaving of the Southwest. 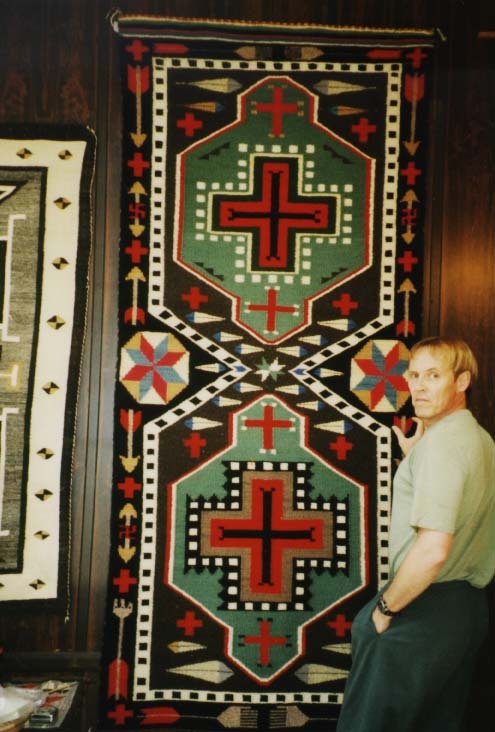 Albert, one of several male Navajo weavers associated with our studio, was featured in the Museum of Indian Arts and Culture (Santa Fe, NM) 1999 exhibit: "Weaving in the Margins: Navajo Males as Weavers". 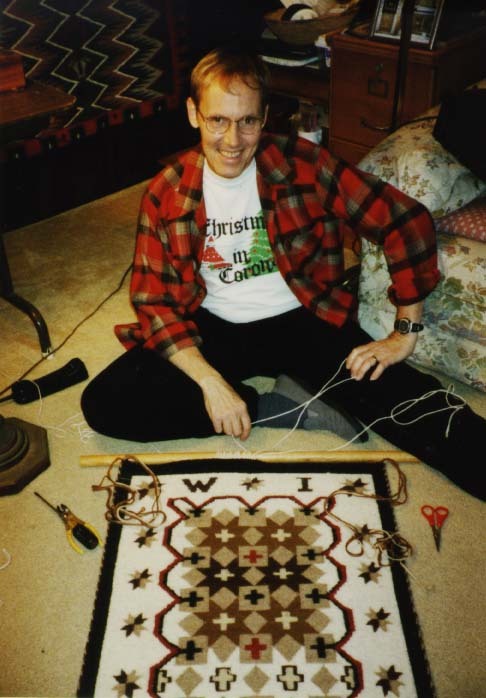 The weavers expressed a desire to weave something special when they visited the studio in the beginning of 2003. The piece came off the loom in early May. 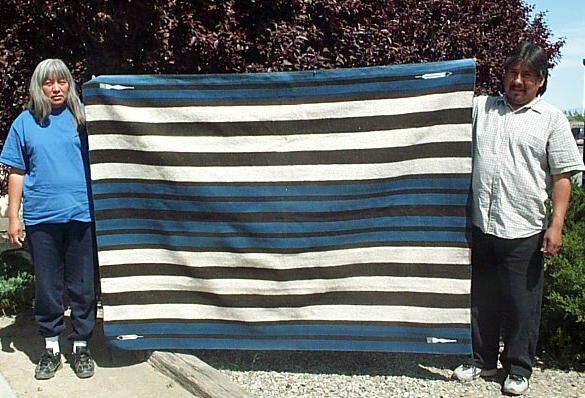 The weaving shown is 75" x 55", the same size as the Hearst blanket. We provided all natural beige and dark brown, mill-spun, Churro sheep yarn for this weaving. The indigo blues seen in the blanket are bleached, white Churro yarn which was dyed at our studio in 6 batches so that a variety of blue color would enhance the blanket’s appearance. The yarn for the selvage cords is Brown Sheep Co. mill-spun, worsted, white, single-ply wool which contains 15% mohair for luster. This worsted yarn was re-spun by the weavers after we dyed it indigo. Then they "Navajo-plied", i.e., Navajo hand-3 plied it. Three of these 3-ply, tightly-spun cords were used for the selvage for complete edge protection such as is found in the best early wearing blankets and saddle blankets. The 2 dark brown end cords were also "Navajo-plied" (3-plied) for extra strength, a technical feature still found today in some high quality Navajo weaving. We asked the weavers to add pictorial elements of weavings combs and feathers in the corners in a creative departure from the original Hearst piece. Long lazy lines are shown while the blanket was still on the loom, and are most evident where different shades of indigo meet. The piece was finished beautifully by shaving off the superficial hairs for a smooth surface. 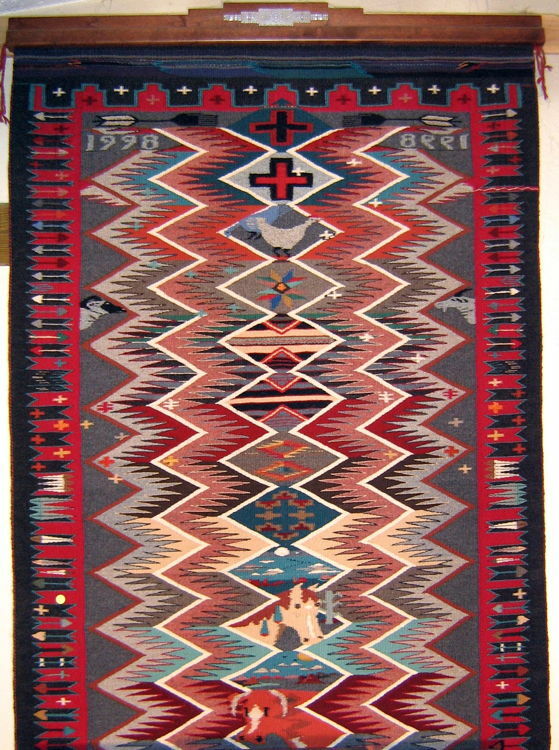 In the old days, before electric hair shavers, the Navajos would throw these weavings on hot sand over and over to singe off the surface fuzz.